How to add / submit website or blog to Google News? Google News showcase latest news from different topics and categories from around the world. If your blog or website is listed in Google News, you can receive loads of traffic. Besides the traffic, your website gets instant popularity and appreciation from readers throughout the world. Each inclusion request to Google News is manually reviewed and many are not included for quality reasons. You can try luck and send your blog or website URL for inclusion into Google News. 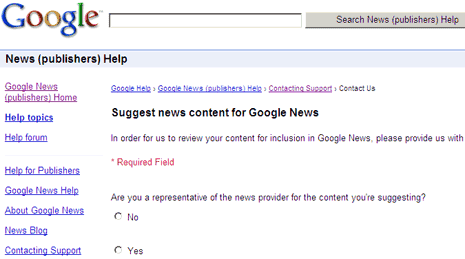 Click here and then click “Suggest news content for inclusion in Google News” to load an online form for Google News inclusion. It is a long form and you need to provide lot of details. Be specific and provide required URLs for proper review and possible inclusion. Give it try, Google News might like your blog or website! Thanks for the post.. I am looking for such a tutorial. Tell me how many days does it take to varify a site for news. Its a big gain if website get submitted and approved for google news , this helps to boost lots of traffic. Very helpgful! Provided direct link to Google submission saved a lot of my time. this is really helpfull .. now i can use it.. Handy tips to my blog. Got your article in time. Thanks dude. If you are having trouble in adding your website in google news or being rejected. Then, I can help you friends, if you wish to add your website in Google. That pretty easy for me now. Well if your news website have daily updated and latest news, unique content, seo friendly urls, sitemap as per google news then your news site will be included in Google news very soon. I said it this because i did it and i got succeed. Sherlly, could you please contact me, thank you in advance. I have used my web China Fact Tours to try several times. But it is not easy to get inclusion on Google News!!! Its possible but usually you will need good established newsworthy content blog/site, regularly updated and more than one author contributing to the news blog/site.